Now a day’s every product comes in an exclusive package. Even a small product is packed exclusively by which customers or clients get attracted to it to purchase. Same is the case with CDs and DVDs now. CDs & DVDs are common in today’s era. Every small or big occasion or product launch or any software installations now a day’s has CDs or DVDs. CD cover plays a vital role as it is what gets a person’s attention in the first place.Anything that is packed in a good CD cover that attracts the attention of the person can make its visibility more conceivable and gives it a better chance of having an impact for sales. 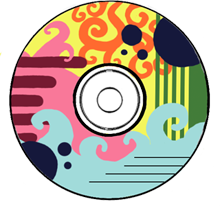 Quad Softtech has a team of expert designers having experience in the field of CD/DVD cover designing. We work with the aim of providing extensive solutions to our clients and thus we work hard to create outstanding, creative and impressive designs to give you an edge over your competitors.